A social community where about 45 elderly live together in separated houses, helping each other when needed, all voluntarily and without restrictions. Social activities to prevent loneliness. The low age limit set as a criteria to enter the community makes sure that the average age stays in the middle. The younger people can do more work for the older once. 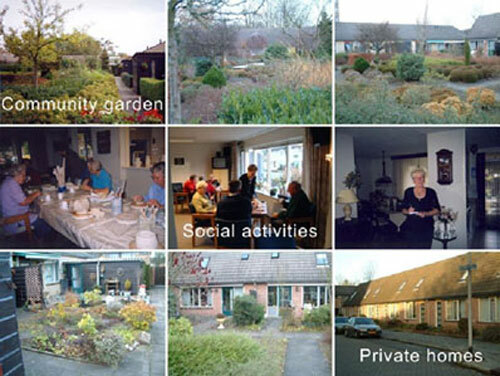 In 1984 a group of elderly people that didn’t feel comfortable living alone, but even less comfortable living in an elderly home, came with the initiative for an elderly living society in Eindhoven. These people wanted to have an environment that was better adjusted to the needs and wishes of their age category. Some of these people lived on their own and felt lonely, with little or no social connections to society. Other people felt insecure in their own houses and wanted to get a safer feeling. Others needed regular attention from healthcare but didn’t want to go to an elderly home. Aquarius is a social community of older people. They want to grow old together. They have there own private home and garden, but also a communal space and large communal garden. The inhabitants help each other out as much as possible. There is a committee to organise the community. One of there tasks is to visit possible new inhabitant and vote if they will be good new inhabitants. You’re allowed to subscribe when you’re between 55 and 65 years old. (To make sure there are always younger and older residents) Everybody is free to do what he or she likes but they want everybody to help each other out when needed. They organize there own communal activities inside the communal space. Overall Aquarius is a community were elderly people can spend there days in a very social active environment. It goes back to the time where neighbours were good friends and helped each other out when they are sick etc. The community started in 1990, since then not many things changed except several new inhabitants replacing others. This showed that there policy works and still interests elderly people today. Elderly communities are high diffusion, because you can find them at various places. But the community as it is organised at Aquarius is a combination of the best aspects of various earlier communities. The system of Aquarius itself has a low diffusion. Optimised phase, it’s already running several years. They first spend a lot of time to find the good aspects of other elderly communities to implement in there own community. Now the buildings are build and the inhabitants are living together only small changes are done to improve the community. Inhabitants rent their houses from the Eindhoven housing society who owns the buildings. They all together rent the communal area (costs divided over all inhabitants). The committee work is voluntary. The main garden is maintained by a gardener which they need to pay all together. Living in Aquarius stimulates active social contact between the inhabitants. It helps them to keep their life as vital as possible. They will have a safer and more friendly environment around them, or at least it will feel more friendly. Most of the activities are located inside Aquarius. This means that inhabitants can walk to them. It results in less travelling. It often happens that children of elderly need to come by and help them with several things. In Aquarius most of these jobs are don by fellow inhabitants, that also saves a lot of transportation. The economics around Aquarius are almost the same as normal life. They rent a house and the activities are organised voluntary by fellow inhabitants. It safes some money when the effect of helping each other happens a lot.